The most popular card routine used by professionals to get audiences involved is a multimple selection and revelation routine. 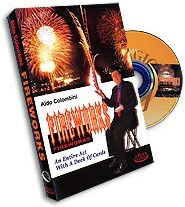 On this DVD Aldo Colombini tips all the work for his version of this classic plot where twelve audience members select cards and you find them using flashy and impossible revelations. The impromptu routine can be used as part of a show or an entire act. What makes Aldo's version exceptional is his method of controlling the cards. THe card control is by far the best, easiest, and most direct method ever created. The routine is also structured to allow you to easily adjust for additional or fewer cards depending on the size of your audience. The revelations of the cards create an explosion of magic that audiences go crazy for. It gives the impression of high skill and advanced sleight of hand.